Do you want to advertise in the next Sedlescombe Directory? Simply click on the information tab above for all you need to know. Each year, Sedlescombe Parish Council publishes an Annual Report in the run-up to the Annual Parish Assembly. Included with the Report is a Directory of local businesses together with contact details for Village Organisations, Societies, Charities etc. and other useful information. The Parish Council is grateful to local businesses whose purchase of advertising space has paid for the printing of the Annual Report for several years. Annual Reports 2006 to 2017 are available to view online at by clicking here. December / January – local businesses are invited to submit adverts to the Parish Clerk for inclusion in the Directory. Closing date is 5pm on Friday 1st February 2018. 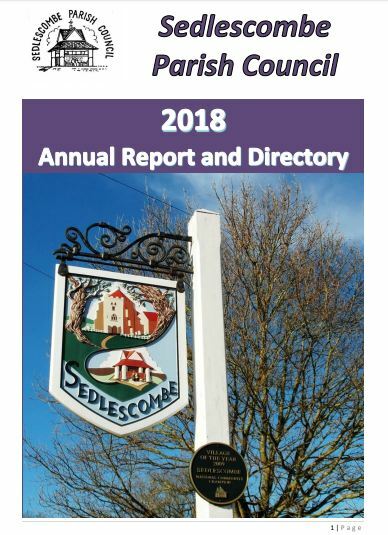 March – delivery of printed Report and Directory to every household in the parish of Sedlescombe by a team of volunteers. TBC April 2019 – Annual Assembly of the Parish Meeting of Sedlescombe. Display tables are available for businesses and organisation to advertise themselves. Tables are free of charge. Please e-mail if you require a space. Remainder of the year – Report and Directory delivered to households recently moved into the parish. Spare copies of the Report and Directory available from The Clerk and in Sedlescombe Village Hall. Printed commercial adverts will be 60mm (high) x 55mm (wide) in black and white only. A short category heading will be placed over each advert. Previous applications will be repeated on request. Please e-mail The Clerk with the information and details of how your payment will be made i.e. by cheque or transfer. Local organisations, clubs, societies and charities are invited to place an advert in the 2019 Annual Report/Directory free of charge. Copies of last year’s entries will be sent to secretaries in January.